The year in question is actually 1953. The politician is Wisconsin Senator Joseph R. McCarthy. The journalist is Edward R. Murrow. And the film that recounts this fight for American ideals is George Clooney’s “Good Night, and Good Luck”. After directing a Charlie Kaufman script for his debut “Confessions of a Dangerous Mind”, Clooney wrote a screenplay with Grant Heslov for this 2005 film about journalism’s ability to speak truth to power. Respected newsman Murrow (played by David Strathairn) —venerated for his 1940 coverage of the London Blitz— wields the weight of his reputation against the forces of McCarthyism with critical news reports on his program See It Now. Clooney’s directorial flare is first apparent in the way he frames the report. We see the broadcast in the CBS lobby. We see the face of Patricia Clarkson’s Shirley Wershba —a CBS employee— as she watches. We cut between shots of Murrow reporting and producer Fred Friendly (Clooney pulling double duty) keeping a watchful eye on the proceedings. And as Murrow reads a statement expressing his perspective at the end, the film’s camera becomes the studio’s camera, and the reporter looks directly into the lens. This sequence is more interested in maintaining the narrative focus on the people putting their reputations and careers on the line than the broadcast itself. Here the tone is set for a film of great urgency. Drawing McCarthy’s ire brings accusations of Communism and pressure from advertisers. Camera movement and focus keep this film progressing at a fast clip that reflects the speed and precision with which the news team combats its enemy. Especially in a shot of the crew congregating for cigarettes and scotch after the first report airs, cinematographer Robert Elswit’s camera is always in motion, even if it’s just a barely perceptible sway from side to side. At many times, blurry shots snap into focus suddenly, plunging us into the rush of breaking news. Dialogue is straightforward and to the point. Characters say what they mean. Time is a valuable commodity in this chaos. At the center of this chaos sits the often-seated Murrow. Strathairn’s performance remains the strongest asset at Clooney’s disposal. His tensely coiled body constantly appears ready to strike back —verbally or maybe even physically–at any attacks. With a raised left hand clutching a cigarette above a resting elbow, his smoking pose— held firmly whether on television or in the office of a superior–gives an impression of the rigid control he is maintaining over a sensitive situation. The actor only lets this posture slip when receiving advertiser-related pressure from network head William Paley. 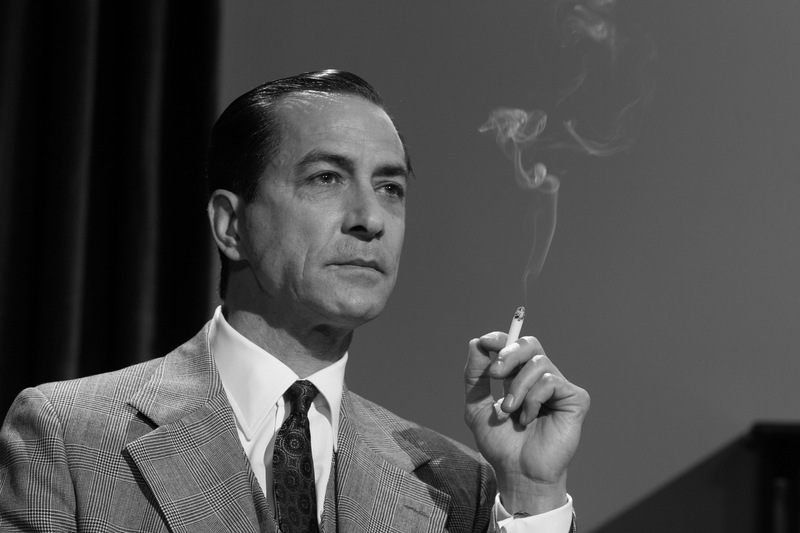 Strathairn plays Murrow as man savvy enough to know that corporations like Alcoa aluminum and Kent cigarettes wield more power to destroy his career than any senator. Watching the mask of precision and control slip is a master class in pantomime. Although their outstanding work was recognized at the time with Oscar nominations for Best Director and Best Actor to accompany the film’s Best Picture nod, Clooney as a director and Strathairn as an actor have never again lived up to the success they achieved with “Good Night, and Good Luck”. The film’s manic energy and smart cinematic grammar simply feel too organic to duplicate in another context. With actor and director working together in perfect harmony, they did career best work that will continue to resonate with contemporary audiences as long as they have to deal with fearmongers and demagogues.